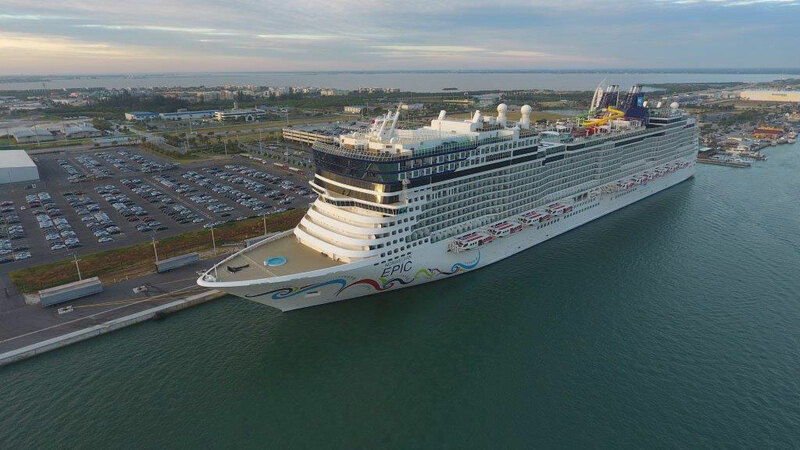 Norwegian Epic arrived in Port Canaveral, Florida on Saturday to begin a new deployment sailing Caribbean cruises. The large 185,870 gross ton vessel departed Barcelona, Spain on October 30 and sailed a 14-day transatlantic cruise. The ship had spent a year sailing Mediterranean itineraries out of Barcelona and has become of the NCL’s main ships in the region. While Norwegian Epic was in Europe it also received a multi-million dollar refurbishment which is part of the cruise lines “Norwegian Next” program. Norwegian Epic is the largest NCL ship to ever home port in Port Canaveral and will offer guests 3-day, 4-day, 5-day and 6-day itineraries to the Caribbean. The ships 7-day Eastern Caribbean cruise will include calls in Tortola, British Virgin Islands; St. Thomas, US Virgin Islands; and Great Stirrup Cay, Bahamas. A weekly Western Caribbean cruise will call at Cozumel, Mexico; George Town, Grand Cayman; Ocho Rios, Jamaica; and Great Stirrup Cay, Bahamas. Norwegian Epic will offer guests who may not have the time to get away for a week-long vacation the perfect opportunity for a quick escape in January and March 2017 with three- and four-day Bahamas itineraries with stops in Nassau and Great Stirrup Cay. Norwegian Epic Is offering two special festive cruises with a Christmas cruise departing its home port on December 23 and a New years cruise departing December 30, 2016. Guests can also enjoy the cruise lines new Broadway shows called Burn the Floor and Priscilla, Queen of the Desert. The vessel can carry over 4,200 passengers at double occupancy and is the only ships of its class.